Regular mealtimes are important for our dogs. But if you’re delayed or working long hours or it’s not always easy to keep to a routine. Automatic dog feeders are a useful tool if you can’t guarantee that you’ll be around at the same time each day to give your dog food. While they should never replace quality time spent with your dog, they do fill a gap and enable you to feed your dog even when you’re not around. An automatic feeder allows you to keep your dog on a regular schedule of food when you’d struggle to do so otherwise. They are particularly useful for dogs that need to eat small regular meals throughout the day and are perfect for managing conditions like hypoglycaemia, diabetes and pancreatitis. 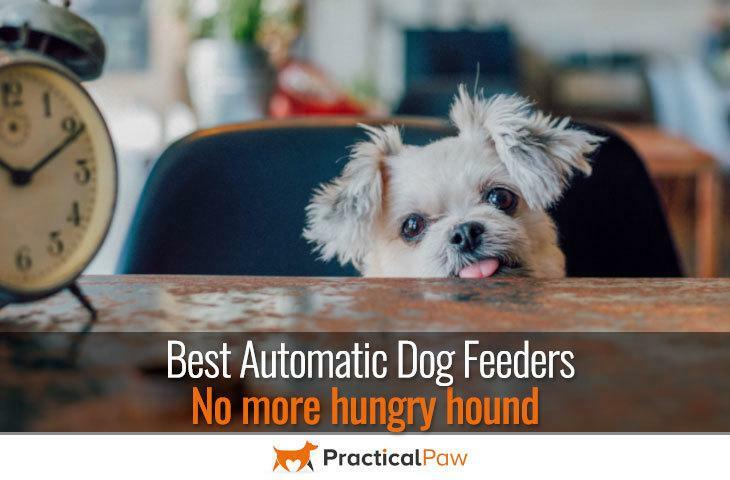 Not only do Automatic Dog Feeders enable you to schedule regular meal times but many of them also allow you to control the portion size of each meal ensuring your dog doesn’t overeat. Most automatic feeders have two parts; a hopper made of glass or plastic that stores the food before it’s released, and a bowl that your dog eats the food from, made of plastic, stainless steel or ceramic. As the name suggests gravity dispensers work by using gravity to dispense kibble. Food naturally falls-down from the hopper into the bowl below. If the bowl stays full, it prevents any further flow of food as it backs up into the dispenser, however as soon your dog begins to eat it allows more food to be released. The advantage of gravity feeders is that they’re simple. There’s no need for pre-programming or complicated schedules. The disadvantage is that your dog can continue to eat until the dispenser is empty. However, they are useful for slowing your dog down while they eat and are perfect for dogs that self-regulate their food intake. Electronic feeders for dogs are generally battery or mains powered and offer much more flexibility. You’ll find hopper and bowl styles, plate feeders with segmented bowls that present one section of food at a time as well as smart options that you can program from your phone. Pre-programming the feeder with meal times and portion sizes gives you total control over your dog’s food and ensures that they always get the right amount of food at the right time. There are lots of options on the market but here are a few things to consider before you make your choice. Do you need to schedule multiple meals? Do you need to offer different portion sizes per meal? Are you a multi-pet household? How determined is your dog to get to the food? The capacity of the feeder – how much food can the unit hold? How many portions can the unit deliver and over what length of time? Do you want additional features like a webcam or ability to record a voice message? We’ve based all our choices on programmable options rather than gravity feeders as we believe these provide a better experience for both you and your dog and help prevent overeating. The Arf automatic feeder gives you the ability to set up to four meal times a day, customise the portion size and record a message to tell your dog it’s dinner time. It’s got a generous 1.4-gallon capacity and distributes up to ten portions of food per meal, each portion being 24ml. The LCD clock and display are easy to read, and you can run it from three D batteries or plug it into the mains. The unit is tall and slim, and there’s an indicator light when the battery is low, so you’ll always know when you need to plug in or get new batteries. The food tray and the hopper are detachable for easy cleaning (hand wash only), and it comes with a magnetic lid preventing ‘all you can eat’ parties while you’re away. The Petsafe Healthy comes with pre-set meal portions delivered twice a day, but if that doesn’t suit you, it’s fully customisable too. With up to twelve meals a day and portions ranging from 1/8-cup to 4-cups it’s suitable for both small and large dogs. Running off four D batteries (a mains adapter available as an optional extra) it provides scheduled meals for up to a year on a single set. The hopper can hold up to twenty-four cups of dry food, but it’s also suitable for semi-moist pellets too. What’s more, there’s a lever inside the hopper that allows you to adjust for the size of kibble. The feeder uses a conveyor belt system to dispense food which gives you an option for a slow feed. This selection enables the spread of meals over a fifteen-minute period helping to prevent gulping and resulting issues like bloat. The stainless-steel bowl is dishwasher safe, holds up to four cups of food and is attached to the unit via a hoop ensuring that it stays in place. The lid locks but isn’t wholly air-tight which means that dogs can smell the food in the hopper. While it’s not an issue for some dogs, others will find it too tempting not to try to raid. The display lets you know when it’s time to change batteries and the translucent hopper means that you’ll easily be able to see when it’s low on food. Because the feeder uses a conveyor belt system, smart dogs quickly learn that with a bit of gentle pushing they can knock pieces of food off the belt and get an in-between meal snack. 6 compartments for use with dry, packaged moist and wet food. This device allows you to keep your pet on a regular feeding schedule. The AF-108 allows you to feed your pet up to (6) six times in a 24 hour period. This tray style feeder from Qpets is perfect for small dogs. It has six compartments each holding up to one cup of food allowing you to feed your dog six times in a twenty-four-hour period. It’s flexible as it’s suitable for dry, semi-moist and wet food (although it can dry out), and you can record a personalised message for your dog to let them know when their food arrives. Battery operated, it takes four size C batteries. As you fill each compartment yourself, it means that there’s no variation in the portions giving you complete control. A lid lock keeps the rest of the food safe until it’s time and there are a clear LCD and clock to make programming easy. The Feed and Go Smart pet feeder connects to your wi-fi network at home. It allows remote access via iOS and Android and a website UI. It has a built-in webcam, so you can keep an eye on your dog when you’re out and about. Not only that, but you can record a ‘food is ready’ message for your dog to let them know that dinners on the table. There’s no need to worry if your internet is a bit flaky. Once you’ve set your schedule, the programs stored in the feeder so even if your wi-fi goes down the Feed and Go is smart enough to keep going without it. Suitable for both wet and dry food it has six compartments that hold up to a cup of food each. And as you control the portions of each meal, there’s no room for error in dispensing the right amount. The unit itself is pretty much tamper-proof and is heavy enough not to be accidentally knocked over. What’s more, if you have more than one dog you can manage more than one Feed and Go from only one profile via your phone or website. Our second choice of smart feeder really is smart. Once you’ve set the Petnet Smart Feeder and paired it to the corresponding app, you can enter your dog’s details, name, age breed etc. and it will offer you the best food choices and portion sizes for your dog. The unit itself stores up to seven pounds of food and dispenses in 1/16 – 1 1/2 cup portions and is suitable for dry food only. The Petnet is mains powered but has a backup battery just in case of a power outage. Not only that, but once your dog’s food schedule is set it doesn’t matter if your wi-fi goes down the unit will still dispense with your dog’s food giving you peace of mind. Not only does the Petnet Smart feeder give you the ability to program multiple feeding times and portion options but you can also connect it to Alexa, Google Home or your smartphone. The lid locks securely to prevent accidental feedings, and there’s a ‘low food level’ sensor to let you know when you need to refill. If you want a simple unit that’s perfect for portion control we recommend the Qpets Automatic Pet Feeder while not as sophisticated of other feeders it does the job it’s designed to do. If you need more flexibility, than the Qpets allows, then the PetSafe Simply Feed Automatic Feeder is our top choice despite the inconsistency in portion size. Although we love the tech of the Smart feeders, they are relatively new and suffer from teething issues. Despite this, they are worth considering in the future as they offer the most functionality.